Although it encompasses only 229 square miles, much less than many other national parks in the country, Zion National Park, UT more than makes up for its small size with its breathtaking sandstone cliffs and beautiful hiking trails. There is only one lodge in the park itself, but fortunately, there are plenty of accommodation options to choose from in the surrounding area. These range from family-owned bed and breakfasts to comfortable budget hotels with outdoor swimming pools to elegant glamping tents set in the wilderness. The variety of choice might be overwhelming, but this list will help you narrow it down to the best. 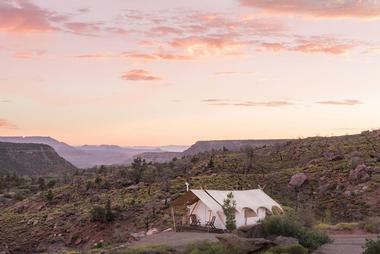 Situated on a beautiful 196-acre property on the edge of the national park, Under Canvas Zion is a unique glamping resort that rents out luxurious permanent canvas tents furnished with cozy wood burning fireplaces, en-suite bathrooms, and private decks. Three different types of tent are available: a suite with a separate bedroom wing, a deluxe option with a king bed, and a tent with a special viewing window above the bed for stargazing. A large central tent offers a fire pit, a restaurant, and several hammocks. Massages and yoga classes can be arranged by request. 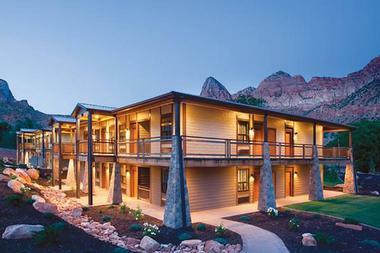 As you might guess from the name, Majestic View Lodge offers stunning views of Zion's red rock formations. All rooms and suites come with private balconies perfect for watching the sun rise over the mountains in the park; other in-room amenities include flat screen TVs, complimentary Wi-Fi, and mini fridges. Guests are also more than welcome to make use of the outdoor pool and hot tub or enjoy a meal at the on-site restaurant, which specializes in steaks, burgers, and other American favorites. Parking is free of charge, and the hotel also provides a complimentary guest shuttle service. The Cliffrose Lodge & Gardens is set on a gorgeous five-acre property right on the river from the park, and it's within easy walking distance of the Visitor Center. The lodge provides direct access to the wilderness and rustic beauty of the park, but the rooms include modern amenities like free Wi-Fi, flat-screen TVs, and coffeemakers. All rooms also have private balconies, some of which offer views of the neighboring park. The hotel also boasts plenty of excellent community amenities, including a waterfall hot tub, a heated outdoor pool, and a charming garden with fire pits. Offering comfortable rooms and stunning views of the mountains, the Best Western East Zion Thunderbird Lodge is only 13 miles outside of Zion National Park. The rooms come with coffeemakers, mini fridges, and flat screen TVs, and some also offer private balconies. Complimentary parking is available, and guests can use the Wi-Fi all throughout the property for no additional fee. Other amenities include an outdoor pool, a 9-hole golf course, and an inviting hot tub. You can purchase breakfast, lunch, and dinner at the hotel restaurant. There is also a small shop selling snacks and beverages. 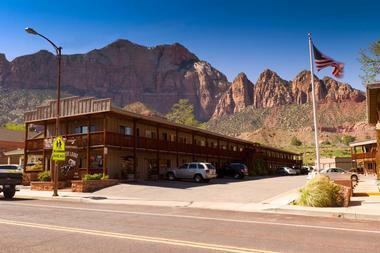 Located near the park's south entrance, the Best Western Plus Zion Canyon Inn & Suites provides excellent views of the surrounding mountains. Guests can enjoy the scenery from the outdoor pool and hot tub or from the company of their own private balconies, which are available in every room. Complimentary Wi-Fi is provided all throughout the property, and a tasty full breakfast is included in the room rates. None of the rooms have kitchens, but they do all offer microwaves, coffeemakers, and mini fridges for guests who want to prepare light meals and snacks in their room. Family owned and operated for three generations, the Bumbleberry Inn prides itself on providing guests with a truly special experience. The rooms are simple but furnished with everything you might need, including free Wi-Fi, microwaves, mini fridges, and sitting areas. As you might guess from the hotel's name, it sells delicious bumbleberry pie in the on-site bakery and cafe. If you're looking for a more substantial meal, you can check out the hotel’s grill, which is open on a seasonal basis. Other amenities include an outdoor petting zoo, a pool and hot tub, and a seasonal local shuttle. 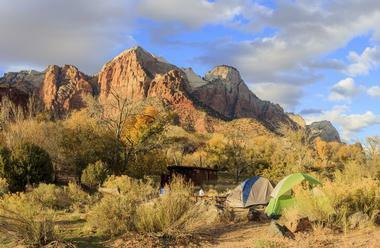 Sitting on the Virgin River, the Cable Mountain Lodge boasts an excellent location right on the edge of the park. The rooms and suites are the epitome of rustic luxury; all have granite bathrooms and flat screen TVs, and some offer additional touches like fireplaces, whirlpool tubs, and balconies. Some suites come with full kitchens, but guests can also enjoy their meals in the on-site picnic area or at the hotel restaurant. The lodge is located within walking distance of Zion Canyon Village, and all guests receive complimentary tickets to an IMAX film about the park that is regularly shown in the village theater. 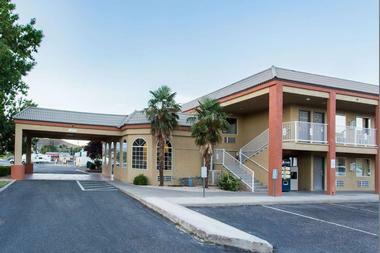 Less than a mile outside of the park, the Desert Pearl Inn is an excellent choice for everyone from families to intrepid solo travelers. 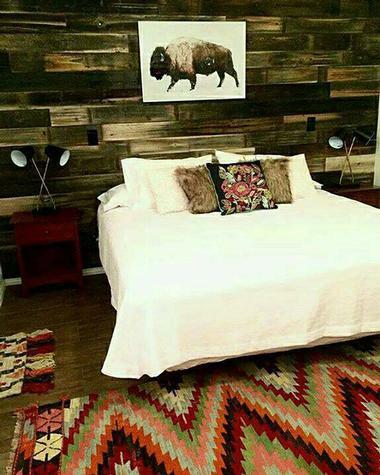 The rooms and suites feature unique touches like locally-made wooden furnishings and floors made from reclaimed railroad trestles, and many also offer views of the beautiful red rock formations in the park. Well-equipped kitchenettes in the room make it easy for guests to prepare their own food if they wish, and guests are also encouraged to enjoy the seasonal outdoor pool and browse for souvenirs at the on-site gift shop. Originally a small lodge opened in 1959, the Driftwood Lodge is now an expansive property with five different buildings and a restaurant that serves up creative, seasonally-inspired cuisine. Some rooms are only accessible by stairs, but guests can request a room on the ground floor if they have mobility concerns. Daily housekeeping services are available if desired, and speedy Wi-Fi is available throughout the property. The heated outdoor pool and hot tub are open on a seasonal basis. When the weather is nice, guests can also enjoy the peaceful picnic area and its barbecue grills. Designed to be a destination in and of itself, Flanigan's Inn & Hotel Zion National Park Springdale UT is a peaceful eco-resort with plenty of amenities, including a spa with a full treatment menu and a rustic diner that offers hearty breakfasts and dinners. 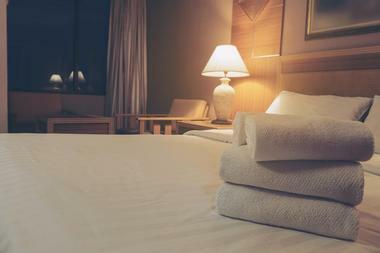 The cozy rooms boast luxurious linens and flat screen TVs, and some also offer patios, fireplaces, or whirlpool tubs. 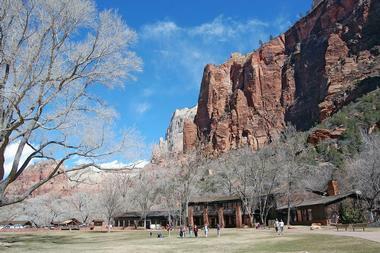 The Zion Canyon Visitor Center is only a 15-minute walk away, and when you’re not spending time in the park, you can relax by the hotel's gorgeous koi pond or visit its unique hilltop labyrinth. 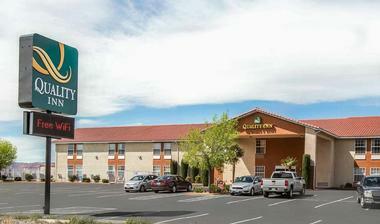 The Hampton Inn & Suites Springdale/Zion National Park is only a mile away from the park entrance, and it offers modern rooms with custom-made beds, large flat screen TVs, and ergonomic work desks. A complimentary hot breakfast is offered every morning, and guests who have busy days planned can even choose to take their breakfasts to go on weekdays. The shops and amenities of Springdale are less than a 10-minute walk away, but the hotel also offers a small onsite convenience store so that guests can stock up on essentials without having to leave the property. With its recently renovated rooms, the Holiday Inn Express Springdale is an excellent choice if you're looking for comfortable but affordable accommodation near the park entrance. Complimentary Wi-Fi is available in all rooms, as are amenities like mini fridges, stereos, and work desks. A complimentary breakfast buffet is served every morning, and guests are also welcome to purchase groceries from the on-site store and prepare their own food in the outdoor grill area. A business center is available for guests who need to get some work done on their trip, and the hotel also offers a seasonal outdoor pool and a fitness room. Set right in the center of Springdale, the Quality Inn & Suites Montclair is an affordable hotel that offers plenty of complimentary amenities, including property-wide Wi-Fi, a daily hot breakfast, and coffee all day long. All the rooms come with coffee machines and flat screen TVs with cable channels, and some are also furnished with microwaves, mini fridges, and jetted bath tubs. The outdoor pool is open on a seasonal basis, but there is also an outdoor hot tub you are welcome to use year-round. Laundry and printing services are available for a fee. Only a mile away from the park border, the Quality Inn Springdale at Zion Park is ideally situated if you want to visit area attractions like Grafton Ghost Town and the Great White Throne. The straightforward rooms are clean and spacious, and they offer amenities like free Wi-Fi, coffee makers, and flat screen TVs. Families and groups of more than two people might want to consider renting out one of the suites, which come with microwaves and mini fridges. A continental breakfast is provided every morning, and other hotel amenities include a children's playground, a seasonal outdoor pool, and a picnic area. The third Quality Inn to be found around the park, the Quality Inn Zion Park Area offers the same wallet-friendly comfort as the other two hotels belonging to the same chain. This location is found near the Sky Mountain Golf Course, so it's in a great spot for anyone who wants to visit Sand Hollow State Park or Snow Canyon State Park as well as Zion National Park. Free Wi-F- is available in all the rooms, which also come with microwaves, mini fridges, and flat screen TVs. Other on-site amenities include a mini golf course, an outdoor pool, and a hot tub. 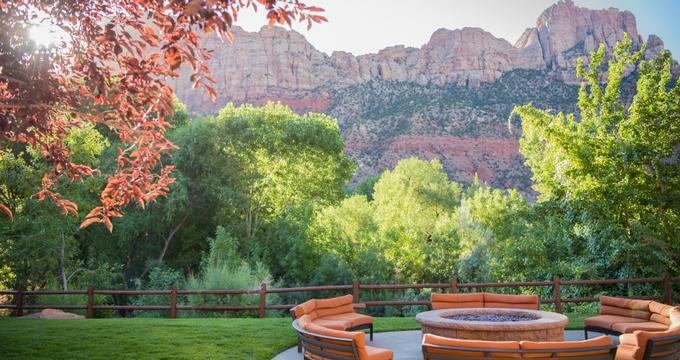 Nestled at the base of the park's beautiful red cliffs, Red Rock Inn is a bed-and-breakfast-style accommodation with eight cozy cottages for visitors to choose from. The cottages can accommodate between two and five people, and children under the age of eleven are welcome to stay at no extra charge. Each room is uniquely decorated and furnished, but all cottages offer Wi-Fi and some also feature kitchens or kitchenettes and separate sitting areas. Breakfast baskets are delivered to the cottages each morning, and guests are welcome to relax and enjoy their food out on the communal patio or in the garden. 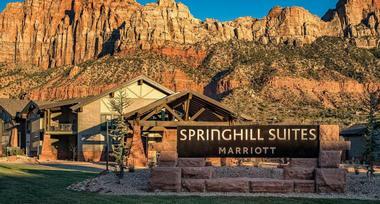 Perfect for guests planning a longer stay in the area, SpringHill Suites by Marriott Springdale Zion National Park offers spacious suites with free Wi-Fi, flat screen TVs, and iPod docks. The suites also offer small kitchenettes and separate sitting areas with work desks and pull-out beds. Some feature balconies or patios. 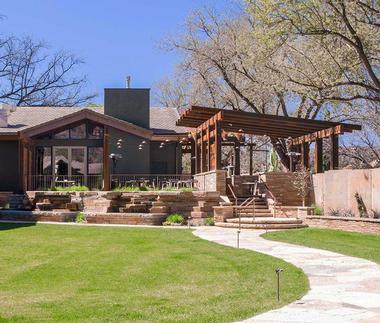 There are plenty of communal spaces for guests to enjoy as well, including an outdoor pool and hot tub area, a deck with comfortable seating and excellent views of the canyon, and terraces with cozy fireplaces. A complimentary hot breakfast buffet is provided every morning. 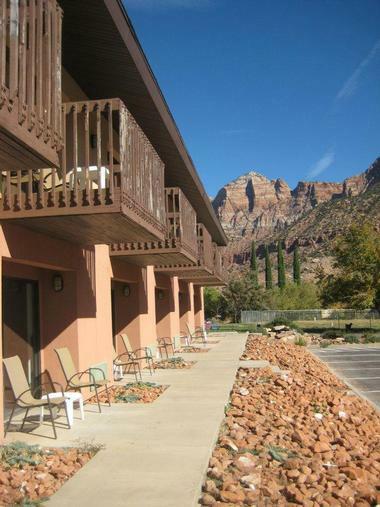 The Super 8 Hurricane Zion National Park is located in the city of Hurricane, 16 miles outside of Zion National Park. The rooms feature free Wi-Fi and cable TV to keep guests entertained; other in-room amenities include microwaves, mini fridges, and coffeemakers. Some rooms and suites also come with Jacuzzi tubs. All guests are welcome to use the heated outdoor pool, which is open seasonally. Children under the age of 17 stay for free if accompanied by an adult, and all guests receive a complimentary continental breakfast each morning. Free parking is available for oversize vehicles. 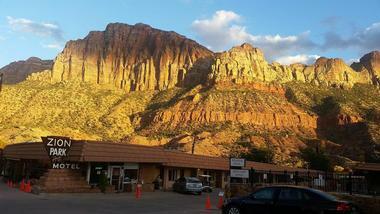 Surrounded by stunning views of the park, the Zion Park Motel has been family owned and operated since 1972. Several different kinds of units are available, including cozy rooms with one bed and six-person family suites with full kitchens, two bedrooms, and separate living areas. Other amenities include cable TV, mini fridges, and air conditioning. Guests are also welcome to enjoy the motel's heated outdoor swimming pool, children's playground area, picnic tables, and shady rest area. Free parking is available on-site, and the complimentary Springdale shuttle stops only a few minutes' walk away from the motel. 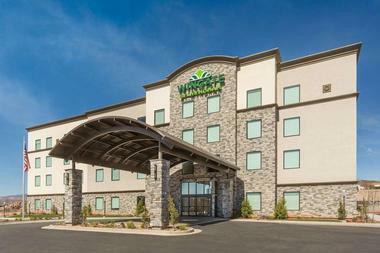 Wingate by Wyndham Hurricane Near Zion National Park is found right in the center of the town of Hurricane, and it offers comfortable rooms and suites with complimentary Wi-Fi and flat screen TVs. Some rooms also come with balconies or pull-out sofas. 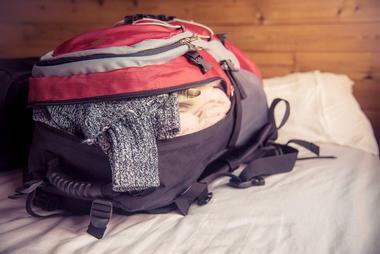 The hotel is within easy walking distance of several local restaurants, but guests can also prepare light meals in their rooms using the provided microwaves and mini fridges. A complimentary hot breakfast is served every morning, and guests are also welcome to enjoy the on-site pool and exercise room at no additional cost. The Zion Lodge holds the honor of being the only accommodation inside the park itself, and it has a wonderful selection of rooms, suites, and historic cabins furnished with flat screen TVs and air conditioning. All accommodation is within walking distance of several trails and of the lodge itself. Inside, you will find a gift shop and a restaurant that serves breakfast, lunch, and dinner. The lodge is open year-round; special rates are offered during the winter season, and the front desk staff are always happy to help visitors plan the details of their trips and book activities and tours. Located only half a mile away from the park's south entrance, Zion National Park - South Campground has 117 campsites to choose from. Both group sites and individual sites are available; the group sites can accommodate up to 15 people, while the individual sites have a 6-person maximum. The sites have no hookups, but the campground does have potable water and a dump station. Campers are also welcome to use their own generators during designated hours in the morning and evening. Reservations are required to secure a space during the busy season and can be made two weeks in advance. 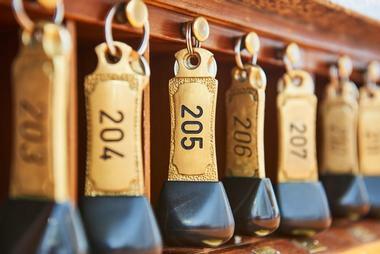 Dating back to the 19th century, Zion Pioneer Lodge is an Old West-style hotel that is almost as old as the town of Springdale itself. All of the rooms come with cable TV, microwaves, and mini fridges, and some also offer Jacuzzi tubs or beautiful views of the canyon. The on-site restaurant is open for every meal of the day, and guests are free to relax in the indoor siting area or use the outdoor pool and hot tub. Complimentary Wi-Fi is available in all rooms. There is also a business center with computer terminals that can be used for a fee. Set on a gorgeous 4,000-acre property right on the edge of the park, the Zion Ponderosa Ranch Resort is a unique destination with resort-style amenities and plenty of activities to keep guests entertained. The resort offers a wide range of accommodation options, including rustic cabins, glamping tents, vacation homes, and a campground that can accommodate both tents and RVs. Free Wi-Fi is available, and amenities include two restaurants, a seasonal outdoor pool with a bar, and a luxurious spa. Guests can also make use of the resort's climbing wall, mini golf course, pool table, and tennis courts.